This past January, I ran a winter photography tour based at Aurum Lodge, in David Thompson Country. 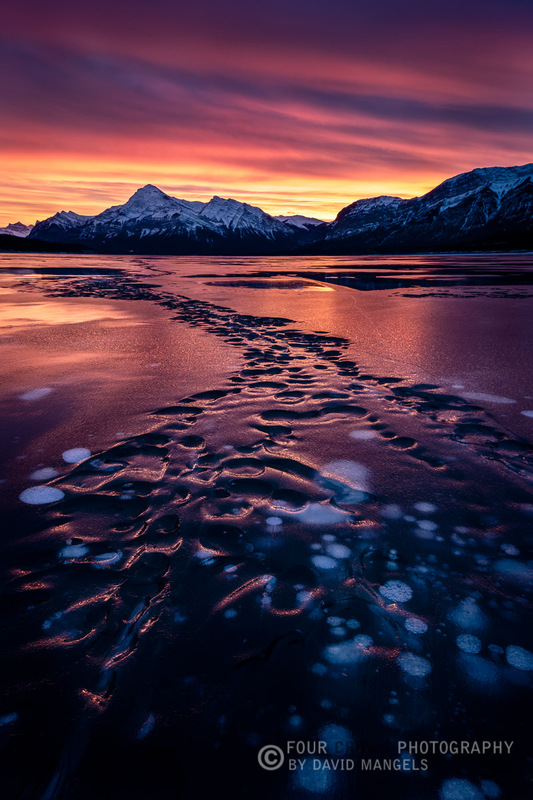 One of the appeals of winter photography in this area, aside from the whole general “winter in the Rockies” scene, is the frozen ice of Abraham Lake which has become somewhat popular of late. Ironically, the weather we experienced on the winter tour was virtually anything but wintry. Temperatures were dramatically warmer than usual, accompanied by strong — sometimes extremely strong! — winds that at times actually felt warm. Rather than get annoyed that things weren’t as we envisioned, instead we were able to capitalize on the conditions and do a few different things than we otherwise would have done. One of our group members was Dave Mangels, who joined us from Boston. He joked that he came to the Canadian Rockies to find winter, but it turns out it was back home as Boston got snow-bombed while he was up here. 🙂 Nevertheless, as an accomplished outdoor photographer with a good sense of personal photographic style and a particular focus on achieving certain results for his line of photographic art prints, Dave made the most of this trip. He loved working on the ice in particular, and took every opportunity to do so. This was my first trip to the Canadian Rockies. One of the challenges that I tend to notice on trips such as this, particularly when the time spent in the region is short, is the collision between a photographer’s expectations and the reality of conditions on the ground. Any photography trip starts with a kernel of inspiration: an isolated image, someone else’s body of work, or just my own imagination. And as a shooter, irrationally, I can’t help but want to capture just what I imagined that I might see when leaving home. This can be a tremendous roadblock to being truly mindful of what is actually happening during the trip. This is all prologue to say that I wouldn’t have expected January in the Rockies to look so much like March. Warm winds, rapidly changing ice conditions, bare ground, and a touch of rain in the air. It took some time to shake off the idea that I wasn’t going to be able to capture a grand snowscape scene. However, focusing on some core objectives that I’d set out for myself prior to the workshop, I was able to come away with a small group of images that I’m quite pleased with. Celestial Colors. Copyright © David Mangels / Four Crows Photography. 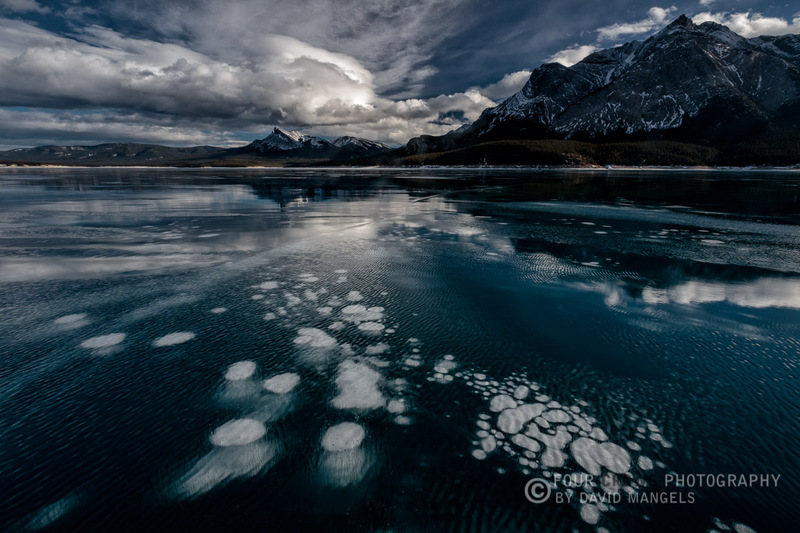 My first goal of the trip was an obvious one: snag a grand landscape of Lake Abraham and its famous ice bubbles. This image was the first stab in that direction, although the weather certainly added some unusual elements to this iconic area. Warmer weather had created a thin sheen of meltwater across the top of the lake, and high winds were pushing it (and us) across the ice. I spend a good deal of time with this composition trying to get a clear reflection without the wind, but ultimately decided that the ripples of the wind pushing water across the lake were too good to pass up. I was also quite taken with the cloud over Kista Peak. It struck me more of the type of cloud that you’d see in the summer, and it reminded me of the grand black and white landscapes that Clyde Butcher does so well. Paths of Ice and Sun. Copyright © David Mangels / Four Crows Photography. This shot was the image that topped what I could have hoped for setting out from home. It’s easily the best sunset I’ve ever had the privilege of shooting. And it’s a lesson in the old adage that you can’t make a good image if you don’t show up at the site. The weather this day was really drab, with thick clouds and periodic showers. We hit the lake prior to sunset with little hope of any light, and I was just focusing on doing some smaller detail work. Once it became clear that the light was going to go off, I was frantically looking for a good foreground. I tend to prefer using a vertical orientation to simplify my frame, and the ice ridges caused by the warming temperature made for a great series of lines leading right up to Elliot Peak. I was howling like a happy coyote walking off the ice after the fireworks were over. Frozen Mosaic #1. Copyright © David Mangels / Four Crows Photography. Crystal Seedling #1. Copyright © David Mangels / Four Crows Photography. Frozen Mosaic #3. Copyright © David Mangels / Four Crows Photography. 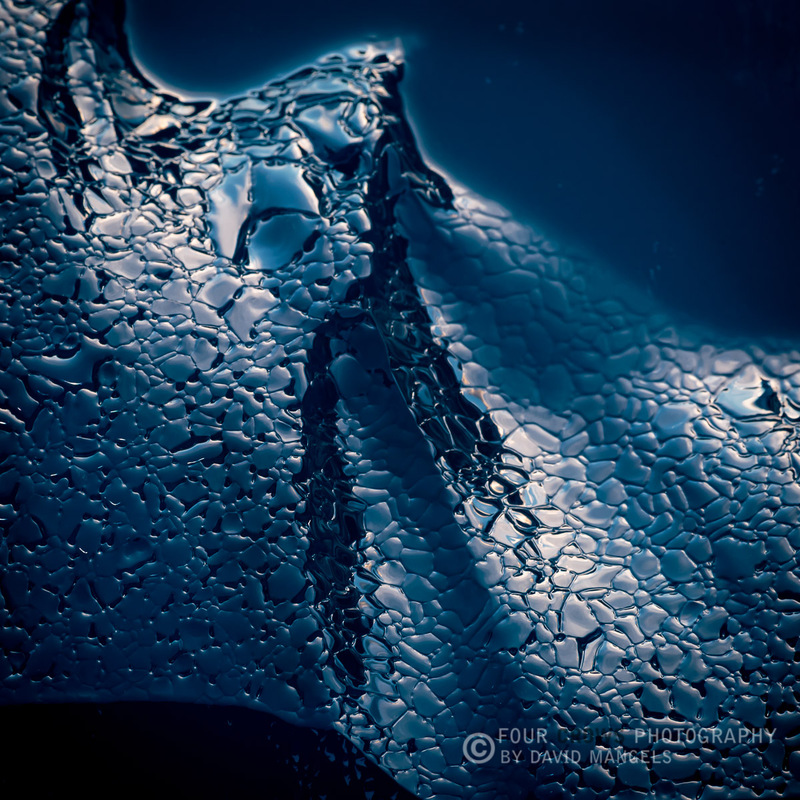 My second objective for the trip was to capture some abstracts of ice shapes, using a square format if possible. I don’t often do macro work, and the aspect ratio was something that I just wanted to play with in order to simplify my frame a bit more. In my head, I was thinking initially of shooting bubbles and ice cracks for this, but I was never quite able to make that work the way I wanted to with the “melty” conditions. What I came up with, however, was a bit more surprising and less obviously a formation so well associated with Lake Abraham. The two “Frozen Mosaic” pieces were shot during a sunset that never quite caught fire. The meltwater over the lake had begun to refreeze and left a delightful texture of scales across the ice. These abstracts are a reminder that interesting light works just as well with a macro sized image as it does with a grand landscape. 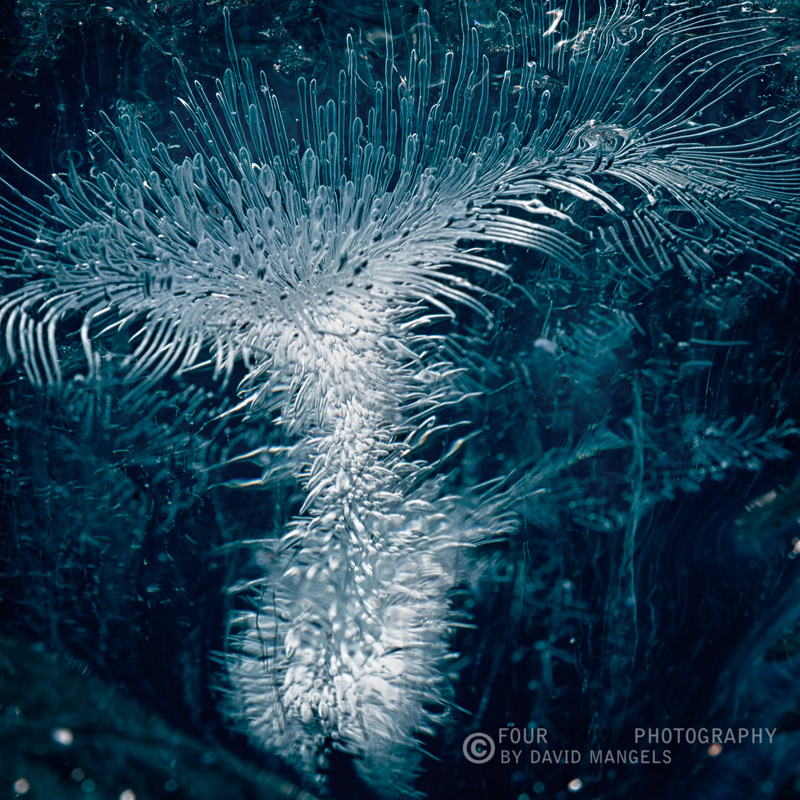 The “Crystal Seedling” was taken on the very last morning of the trip, which for me is usually not a fruitful time as my head is starting to transition from creative space to a logistical travel space. This little formation probably wasn’t much more than the size of a quarter in the creases of an ice crack, and was catching bright mid-morning light. 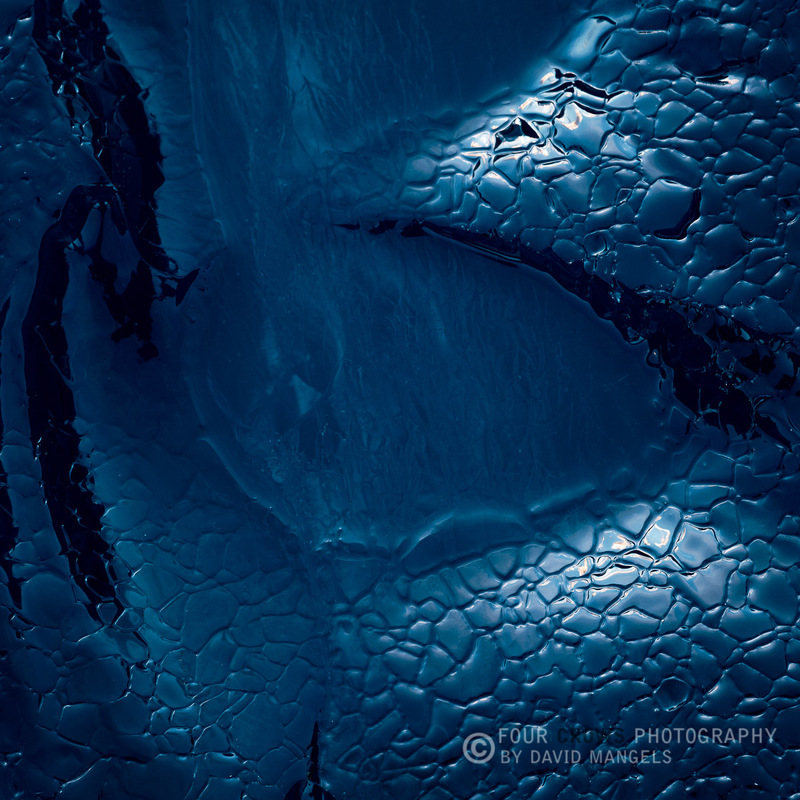 I shot this on my belly down into the ice as it reminded me so much of a new seedling sprouting from the ground in early spring. Seeing as how the weather in David Thompson Country reminded me more of early spring than winter that’s a fitting way to end the expedition. My thanks to Royce, and Aurum Lodge for organizing a fun week! Frozen Mosaic #3=Smoking eye of the ice dragon! The 3 abstracts – “WOW”!! ‘Frozen Mosaics’ Dinosaur scales perhaps?